Cryogenic Breakaway Couplings are a further development of our Safety Break-away Couplings. They have successfully been used to prevent pull-away accidents in the petroleum, chemical and LPG industry all over the world. These can be used on either fixed points or in the middle of hose strings EW Fuel Management have two versions, either Industrial or Marine. Furthermore these can work at -200 Degrees C.
The breakaway is typically installed on to loading arms or hose assemblies where at least one side is attached to a fixed point. A industrial Cryogenic Breakaway coupling is often installed into a loading arm or hose assemblies, where at least one side of the coupling is attached to a rig and fixed point. Release is with a tensile force being applied at an angle to the plane of the coupling housing, up to 90 degrees. Marine Cryogenic Breakaway Couplings are designed to only release by inline pull only and are used between two strings of hose. 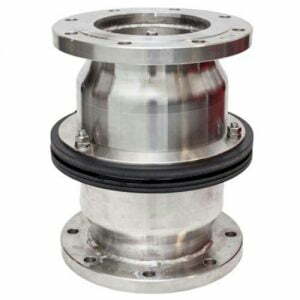 The Cryogenic couplings are available in sizes 1 inch to 10 inch. These are also available with a selectivity code to avoid cross contamination between products.